ANB Futbol’s Jason Mills, captain of his side, team-mate and middle brother between eldest Brandon and youngest Jahsua, has shown great form over the season, and had a big week Oct 1 - 8. Jason scored goals in ANB’s home wins over Sigma in a 2-1 win on Oct. 1 and a 3-1 win over Vaughan on Oct. 5 both at Country Day School. That brought his total to five goals on the season, to go with four goals for brother Jahsua. The pair helped to power ANB up the standings to fifth place with twenty-two points on sixteen games. For Jason, the late flurry of goals was just what ANB and he needed. "I'm happy with the way our team performed in the second half of the season. It feels good," said Jason. "This past season was a good experience for myself as well as ANB. At the beginning of the season I thought we would have a solid winning season, but with a lot of changes to our roster along with injuries and inconsistency in our play made it tough. I think next season brings a chance for ANB to really show what kind of team we are. Getting the first season under our belts helped us grow as players and gives us the opportunity to be better next year." Mills' late-season tallies were a welcome reward for a season of hard work. He hopes to add to his strike rate in the season ahead. "I felt like I had a good season," he said. "I played in almost every game and felt like I did a good job as the leader of our young team. I set high standards for myself as a player and expect to perform well each game. I finished with five goals on the season, I'm happy with that, but next year I'm hoping to have more." Darren Gertiesingh put on his shooting boots over the Oct 1 - 8 period, and Vaughan Azzurri were the beneficiaries as the forward potted three goals in a Oct 4th L1 Cup 5-0 win over Windsor Stars and a 3-1 loss to ANB Futbol Academy in league play on Oct 5th. Gertiesingh, who also laces them up for York University, the Vaughan under-21 side, and the Vaughan men’s team that were one of two Ontario representatives at Nationals last weekend, was happy to play for the elite League 1 Ontario Azzurri, and clearly has claimed a place for himself for next season with his late-season display. 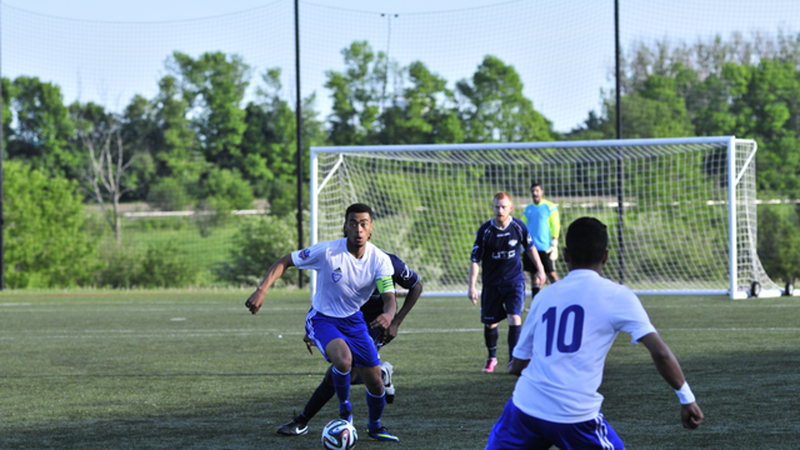 He scored an especially pretty goal near the end of the first half against Windsor at the Ontario Soccer Centre. With Azzurri up 2-0, Gertiesingh took the ball down off a cross, made a beautiful move around a defender showing pinpoint close control and drilled the ball from in close past the keeper. He scored the only goal for Vaughan in a 3-1 loss to ANB, bringing his total to four on the season - a total he may yet add to in the L1 semi-final on Oct 16 vs. Durham United FC, 8 p.m. kickoff at Esther Shiner stadium in North York. "I felt like I was ready to play well, we had some younger guys who were also ready to step up to the plate. It’s a privilege to score in League1, especially two goals in one game," said Gertiesingh.